Have you ever wondered if there’s a secret to planning a high six-to-seven-figure business? What if it were possible for you to create a million dollar marketing plan that fits on a single page? If you’re like most people, you significantly overcomplicate the process of business planning. It’s not your fault though — “traditional” business planning is broken (…and today I’m going to show you how to fix it). Creating a 100 page document full of pointless graphs, charts and projections is unnecessary, unless you need to secure a loan from a bank. Otherwise, it’s an absolute waste of your time. Traditional business plans are a waste of your time. The only time Alexandra and I have ever bothered with a business plan like that was the one and only time we borrowed money from a bank around 9 years ago. And where is that business plan now? I have no idea, and I really don’t care. We never looked at it again (…or borrowed money from a bank again for that matter). So if traditional business planning won’t help you build a high six-to-seven figure business (and in most cases, it’ll actively hinder your progress, sap your motivation, and drive you to drink!) what kind of plan should you create? The answer is an Ignition Plan. There are six clear stages in the process of building a high six-to-seven figure business you can run from anywhere as a Lifestyle Entrepreneur. There are six Income Altitudes you’ll move through to create a high six-to-seven figure business. The first stage is Ignition. Imagine for a moment that your business is a jumbo jet. You’re the pilot; you’ve taxied to the runway, and there’s nothing but blue skies to look forward to once you get off the ground (…and the occasional bout of turbulence if we’re being honest). Before you can get your aircraft off the ground, you need to “start your engines”. And in business that means you need a plan for how you’re going to start those engines, where you’re flying to, and how exactly you plan to get there. Once you’ve started your engines, your goal is to get off the ground. Once you’ve made your first sale, you’re business is “Airborne”. You want to get Airborne. You’ve reached the Airborne stage when you’ve made your first sale. Next, you’ll want to Ascend, or in other words, start climbing to an altitude where there’s less “air resistance” and it’s easier to fly. You’ve hit the Ascension stage when you start bringing in $10k per month consistently. 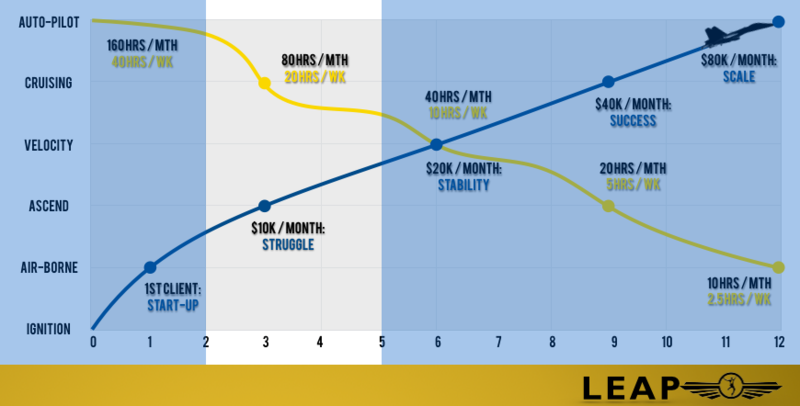 Once you’ve hit $10k per month consistently, you’re at the “Ascend” Income Altitude. From here on, your goal should be to double your income and double your time off at every new level. I call these levels your Income Altitudes. So You’ve Hit $10k Per Month. What’s Next? Your next target is to accelerate personal freedom. This is the Velocity stage. You want to double your income to $20k per month (at which point, pretty much all of your money concerns will be handled). If possible for you, you also want to double your time off at this stage. For some people that means actually taking some time off! For others it means going from one day off per week to enjoying a full weekend off, consistently, every week. 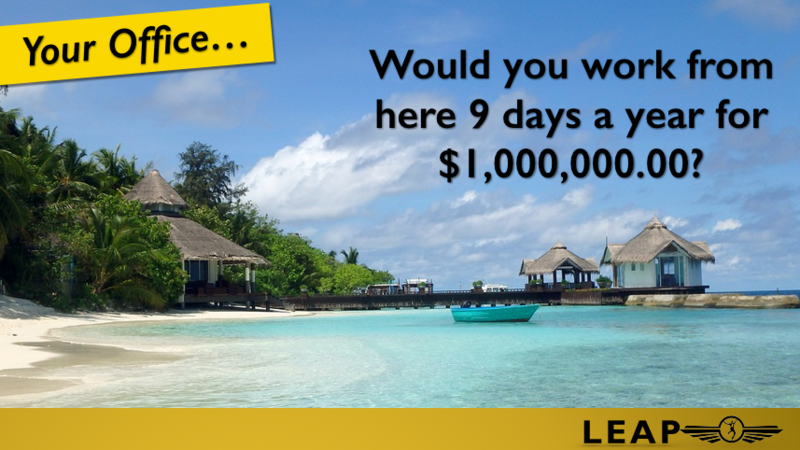 At “Velocity” you’ll double your income, and double your time-off. Once you’ve become Airborne… then Ascended… and increased your Velocity… your next target is to reach the Cruising Altitude. 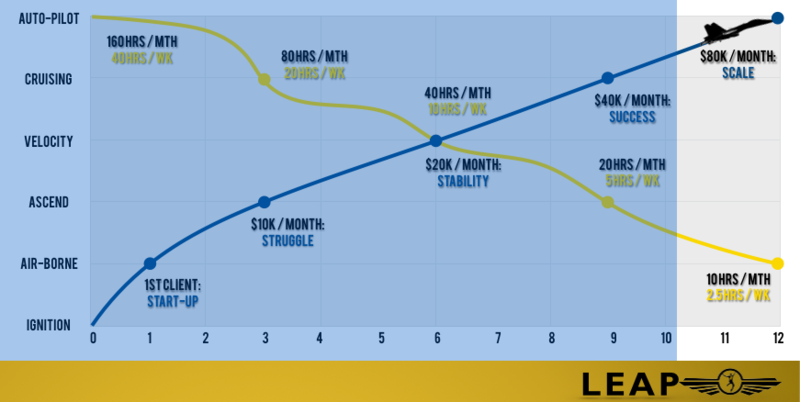 How Does $40k Per Month In 5 Hours Per Week Sound? Have you ever noticed when you fly that after about 30 minutes of steady climbing, the Pilot will announce that the aircraft has reached the “Cruising Altitude” of roughly 30,000 feet? What is the Cruising Altitude? It’s the point where there is the least resistance… where the plane can fly the farthest with the amount of fuel available. And that’s your next goal. 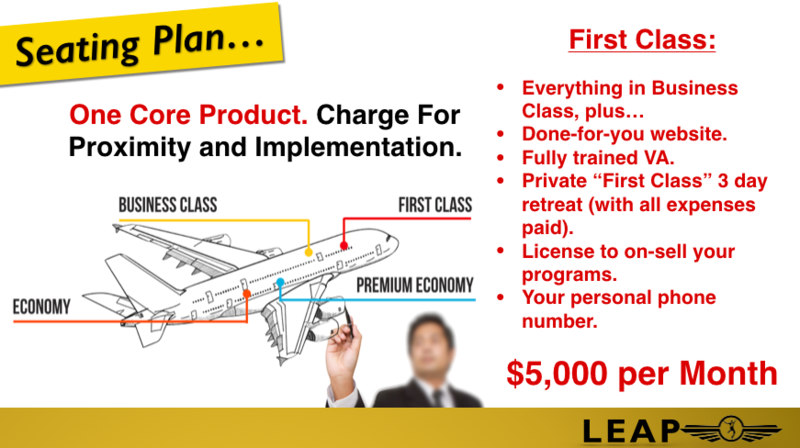 You’re at your Cruising income altitude when you’ve doubled your income to $40k per month. You’re “Cruising” at $40k per month. No more money worries for you! At this point you’ll most likely have built (or at least begun the process of building) a solid team who can handle the vast majority of the tasks required to run your business for you. If you’ve not achieved that milestone yet; building a team who can run your business for you, and automating everything that doesn’t need human input, you’ll never reach the next income altitude — Autopilot. You’re on Autopilot when you’ve doubled your income again, from $40k per month to roughly $80k per month. “Autopilot” gives you $1,000,000 per year. That’s roughly $84k per month. I say “roughly” $80k, because if you want a million-dollar per year business, you’ll need to be generating $83,333.33 per month (so let’s just round that up to $84k). Now you know the six income altitudes, so it’s time to set two Income Altitude goals. 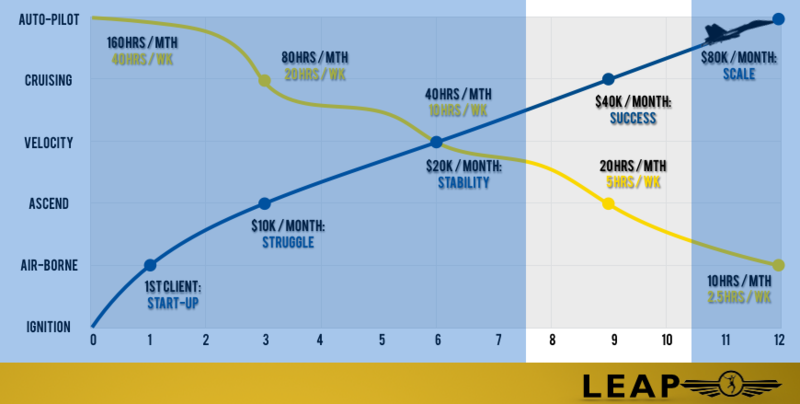 Firstly, let’s get clear and face reality — How much monthly income are you generating (from all sources) right now, today? For the maths, let’s say you’re making $6k per month. Where do you want to be within the next 12 months? Let’s assume a million dollars per year is your goal, so that’s $84k per month. That’s an income gap of $78k per month within 12 months that we need to bridge. Next ask yourself how much do you want to be making per month in the next 90 days? Set your Income Altitude goals… How much money do you want to make? 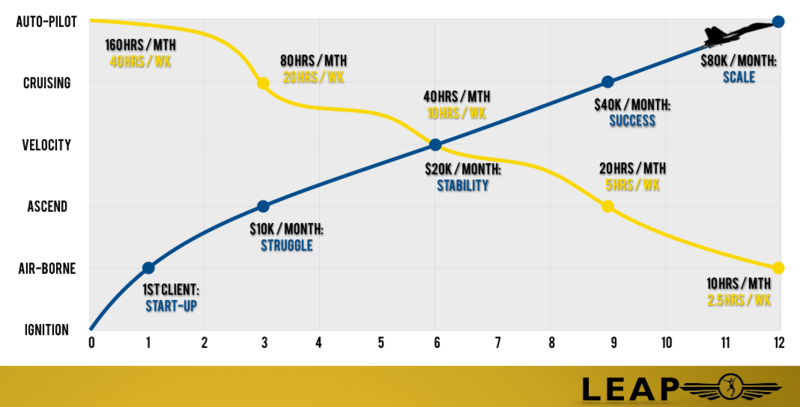 A realistic goal (if you follow my plan) is to at least hit the Ascend level ($10k per month consistently), or if you want to stretch yourself, aim for Velocity and $20k per month. We’re going to stretch and go for Velocity, which means your goal for the next 90 days is to increase your monthly income by $14k. You’ve probably heard all you could ever care to hear about “choosing a target market”. You know it’s important… and you also know it’s pretty boring to do the research. So, we’re going to skip it. Create a message that magnetizes your perfect clients to you when they see or hear it. Just answer these questions and create a Million Dollar Message that speaks directly and clearly to the exact right clients for you, and you’re already 80-90% of the way there. A simple answer might be “Business Coaches”, or “Ballet School Owners”. Nothing too complicated there, right? Now we’ve got “Unconventional Business Coaches”, and “Passionate Ballet School Owners”. Next, write down the specific result you can help those people achieve. The last step in defining your Million Dollar Message is to uncover the one key benefit of buying what you sell. The simplest way to do this is to add “…which means…” or “…so you can…” to the end of your result. Sell premium coaching packages via webinar, which means you’ll never waste time in face-to-face coffee meetings again. Generate 1,000 sales-qualified prospects within 30 days so you can focus on working on your business instead of constantly chasing your tail. Automate enrolments and free up 3 hours a day within 30 days so you can spend your time teaching what you love instead of drowning in paperwork. Notice that I added an “instead of” statement to the end of a couple of those examples. It’s because unless you’re a psychic, or you’ve taken our EPIC: Extreme Personal Improvement Challenge program you won’t immediately be able to tell whether the person or people you’re marketing and selling to are motivated by pleasure or pain. It’s a fundamental tenet of behavioural psychology that humans are motivated to gain pleasure and avoid pain. People are motivated to move toward pleasure, and away from pain. When you don’t know which is the primary motivator for the person you’re dealing with (or in this case, marketing to) it makes only sense to cover both bases. Which is why you want to outline the result you deliver… and then explain the benefit in both “towards” and “away from” language. Your Million Dollar Message is incredibly powerful. Put it on your business cards, your website, and replace your elevator pitch with this simple sentence. (c) Move sales-qualified leads towards purchasing. We cover this in detail in the LEAP — Lifestyle Entrepreneur Accelerator Program. 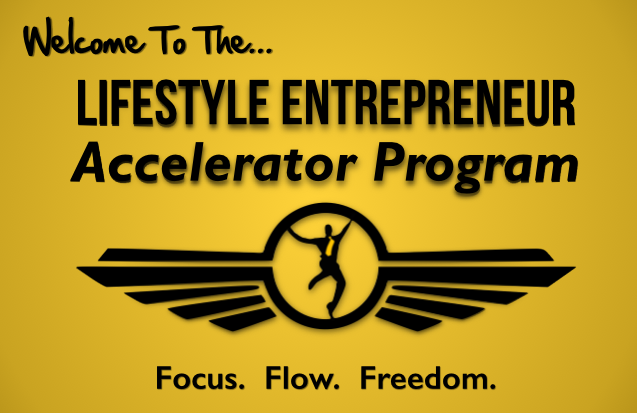 The Lifestyle Entrepreneur Accelerator Program is one of SDI’s “Premium Economy” seats. high-quality prospects into high-paying clients. your high-paying clients in just two-to-ten hours per month. See how powerful the right Million Dollar Message is? 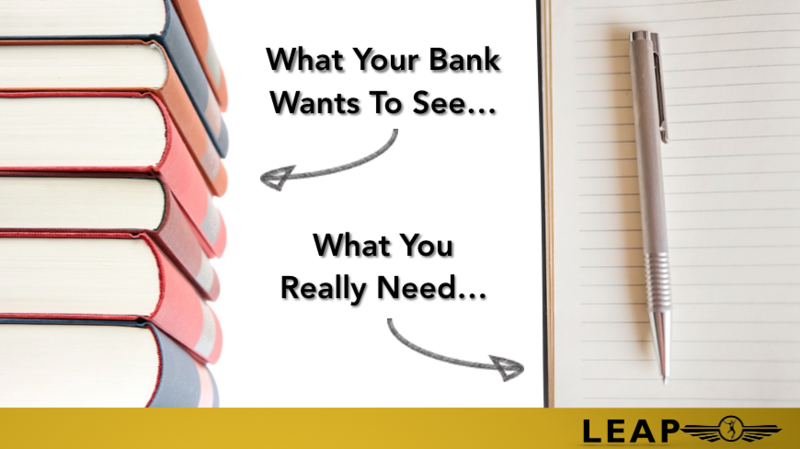 Now we know who you’re selling to, and how you’ll explain it to them… let’s dig a little deeper into what you’re actually selling. Where do you usually sit when flying? Or do you “get stuff done” in Business Class… with complimentary in-flight wifi… extra leg-room… and generous baggage allowances? Perhaps you’re in the back half of the plane somewhere — in Economy or Premium Economy if you feel like splurging a little? Sketch your seating plan to turn one product into many, with little to no extra work. It’s designed to produce one result — to move the passengers from origin A to destination B via the air. Yet within that one product, there are multiple price points, with varying levels of comfort, service, personal attention and inclusions. And that’s exactly the way it should be in your business. So let’s sketch your seating plan. 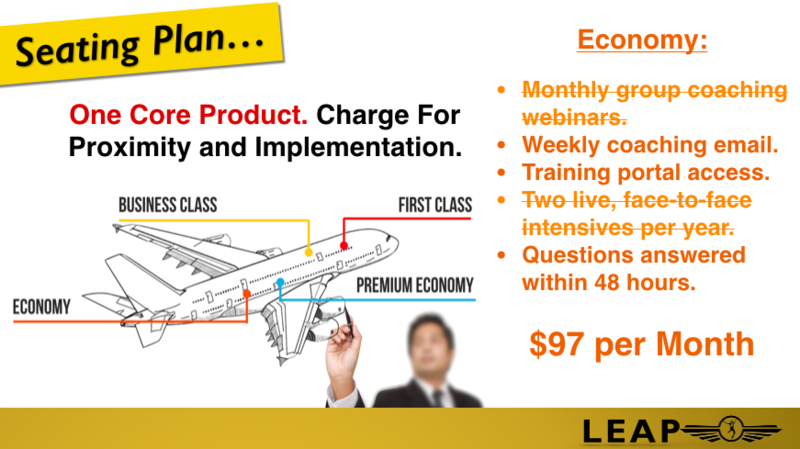 Start with your Premium Economy seat, and add or subtract deliverables from there. Automate your marketing, and fill your pipeline with a steady-stream of high-quality prospects. Deliver to all of your high-paying clients in just two-to-ten hours per month. 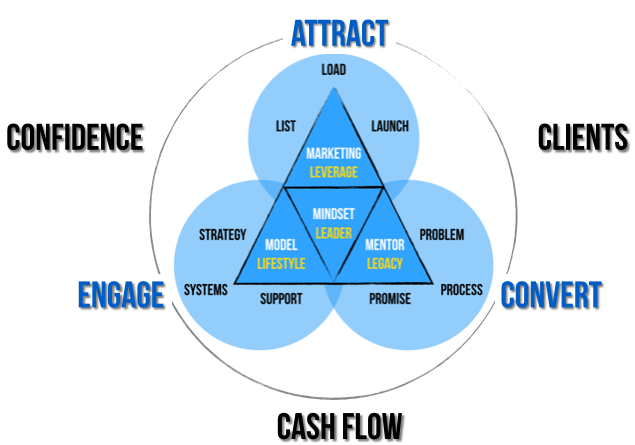 To build a high six-to-seven figure business you need systems to attract, convert and engage. The first thing you need to know is which airport are your target clients spending their time at? This will be your marketing channel. Are they hanging out in the lounge at “Facebook International Airport”, or are they checking in at “LinkedIn Domestic Terminal”? When you identify exactly where your perfect customers are, it’s much easier to reach them. If they’re on Facebook (…and who isn’t these days?) you’ll be considering Facebook advertising. If they’re on LinkedIn, you’ll probably want to skip the ads and look into using LinkedIn Sales Navigator to send them direct, personal messages. The channel informs the approach by nature of the limitations it imposes. Now you know where they are; next you need to catch their attention. Think of this like the viewing area at the airport. Have you ever stood near the huge, glass windows to watch the aircraft take off and land? My son absolutely LOVES to do that. 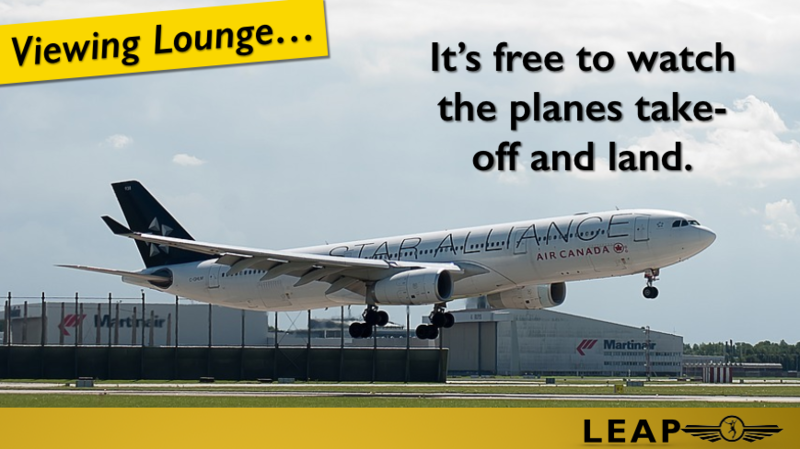 It’s free to watch the planes take-off and land. Every time we travel, he will happily spend half an hour (whilst we’re waiting to board our flight) with his face pressed up against the glass, excitedly watching the planes take off. He watches everything… the planes… the ground-crew… the baggage-handlers… the re-fueling truck… until something specific catches his eye. Doesn’t matter what it is — what matters is that something specific grabs his attention, and pulls it away from everything else he could be paying attention to instead. That’s what you want to do with your potential clients. You need a way to stand out from the crowd… cut through the noise… and powerfully capture their attention so they actively begin engaging with you. The fastest and easiest way to do that is with a Lead Magnet. A Lead Magnet is a tool used for the sole purpose of capturing the attention and contact details of your target clients. (c) Solves one specific problem that your target client actually has (whilst identifying other problems if possible). That last point is vital, and often overlooked. 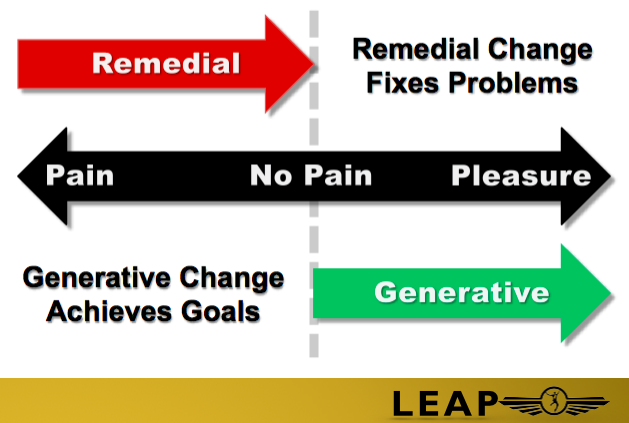 I’ve seen countless lead magnets that are short and easy to consume, but completely miss the mark because they don’t solve a specific problem, for a specific person. 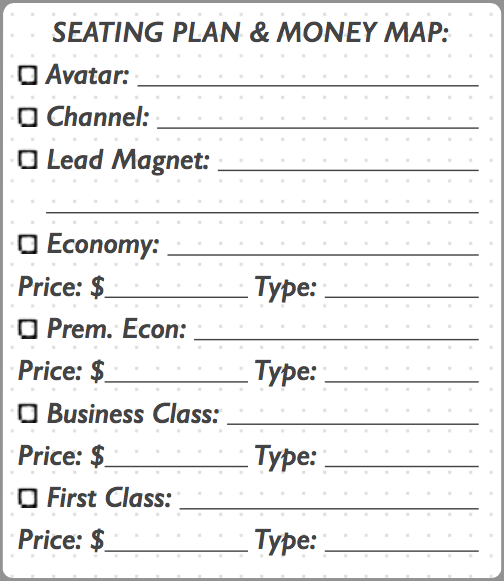 A perfect example of a Lead Magnet is the free “One-Page Million Dollar Marketing Plan”. It’s short, easy to consume, and solves the problem of turning everything you’re reading here into an actionable tool you can implement immediately in your business. Short: Yep, it’s just one-page long. Easy to consume: Hell yeah. You literally tick the boxes, and fill in the blanks. Solves a specific problem: You do want a million-dollar business plan on a single page, right? Or would you prefer a forty page document you’ll never touch again? Okay, now you’ve got your Lead Magnet. No money has changed hands yet, so let’s fix that and get you paid. To recap the journey so far, you’re at the “Airport” (Marketing Channel) where your target market is hanging out. And you’ve captured their attention in the “Viewing Lounge” (Lead Magnet). Remember, anyone can go to the Viewing Lounge without buying a ticket to board a plane. To actually make money, you need to sell some tickets, and get people aboard your plane. This is where the seating plan we discussed earlier comes into play. Assume for a moment that you sell Coaching or Training of some kind. That’s your plane — your coaching or training. For simplicity, now we’ll just call it your “product”. Your Seating Plan consists of one core product offering with differing levels of access and assistance. Let’s look at it in practice. As a Coach, your core offering is … coaching. But what type of coaching? One-to-one coaching… small group coaching… delivered face-to-face, or over the internet? There are many variables you need to take into consideration. The core-offer is the Premium Economy seat on your plane. It’s a little better than the low-end, Economy seat, and not as good as the Business or First Class seat. Always start with the Premium Economy seat (or assume that your product is a Premium Economy product. The reason why will become clear in a moment). Taking your core offering as your Premium Economy seat, detail exactly what you give at that level, and how you give it (we call these your “deliverables and logistics” respectively). Group coaching; no more than 50 people at a time. Access to membership portal of your website. Two live “members-only” events per year. Monthly Zoom meetings. (Zoom is the awesome live webinar system we use to deliver webinars and coaching sessions). Weekly email sent to your inbox. (You can automate this with a CRM like Ontraport). Travel to exotic locations around the world. Virtual access to our team. Once a month, we’ll meet using Zoom for a Group Coaching Webinar where you can ask any question you like, get coaching from me personally, and interact with, and learn from, everyone else in the program. Every week you’ll get a personalised email from me direct to your inbox, giving you access to step-by-step training and templates in the members-only portal on our website. Twice a year we’ll travel to a new, secret exotic location for a hands-on, face-to-face, highly interactive training intensive where we’ll move from “information” to “implementation”, and actively build your business so by the time you get home, you’ll already have the “work” done, and can just press the launch button. Anytime you need a question answered in between your monthly coaching webinars, and twice yearly live intensives, you can post it in the members-only Facebook group. All questions are answered within 24 hours. Next, decide what the price point is. 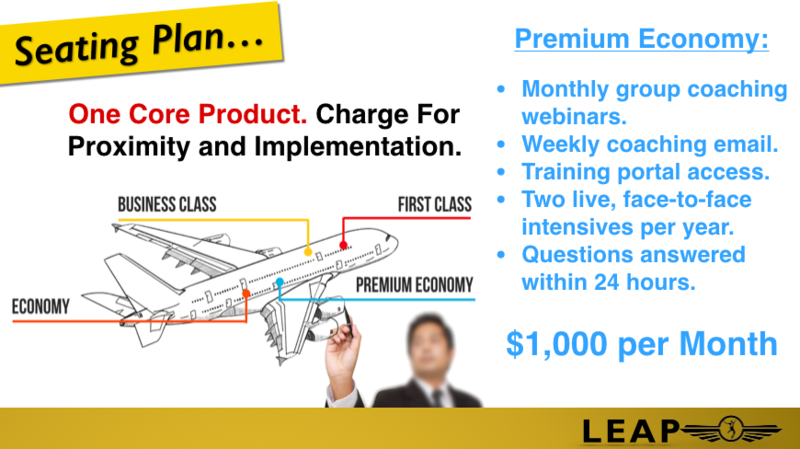 For our example, we’re going to assume $1,000 per month for “Premium Economy Coaching”. Your core-offer is your Premium Economy seat. Add or subtract deliverables from here. So now you have the Premium Economy seat… what about the other seats? With your Premium Economy core offer clearly defined, you simply add or remove components to sketch out the rest of your seating plan. The Economy seat should be roughly five to ten times cheaper than the Premium Economy seat, and contain roughly half of the deliverables and logistics. No monthly group coaching webinars (I.e. You don’t get live access at this level). Access to the members-only training portal. 48 hour turn-around on questions in the Facebook group. For this, you’d charge roughly $97 per month. For $97 per month, your clients get a weekly email with access to training and templates, and their questions in the Facebook group will be answered within 48 hours. It’s important to note that you don’t have anything EXTRA to deliver in order to offer this level. Yet you’re able to offer a lower-priced program for people who aren’t yet ready to buy a Premium Economy seat, but still want to be involved with you. Remove elements from your Premium Economy offer to create your Economy seat. Over time, they’ll come to know, like and trust you more, and many of them will upgrade to Premium Economy. (There are specific strategies on how to do that too… and we’ll cover that in detail in LEAP). 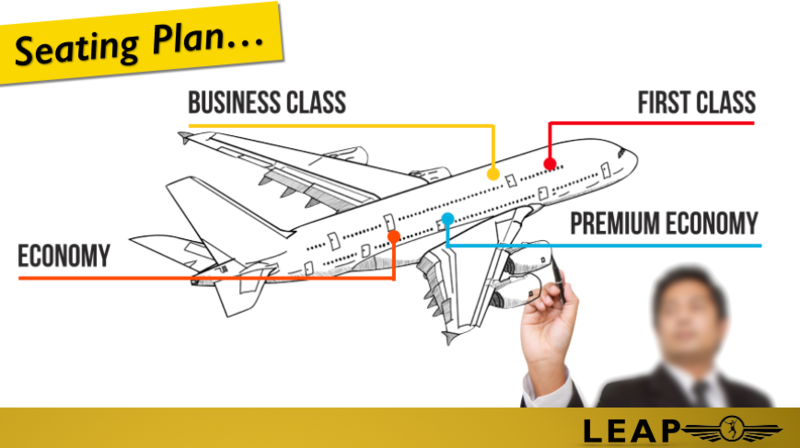 Now, to go from Premium Economy to Business Class, you’ll need to add a couple of extra deliverables. Don’t make the mistake of adding too much though. An additional Mastermind Day before each of the twice yearly intensives. A once-off, two hour, one-on-one personalised planning session with you to customise the program to your client’s specific needs. Direct email access to you (instead of only Facebook support). For this, you’d charge $1,500 to $2,500 per month. 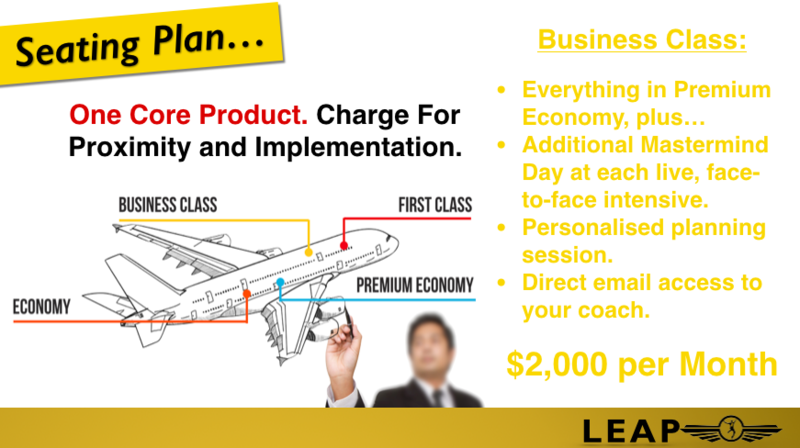 Business Class is the next logical step up from Premium Economy for 10 to 20% of your clients. Only 10 to 20% of your clients are going to upgrade to this level, and that’s fine. Knowing that in advance, you can use it to your advantage, and only make 10 places available per year. And finally, let’s take a look at your First Class ticket! The First Class level serves multiple purposes. First, it’s a “Golden Goose”. When someone buys this level, it’s party time for you, because it’s significantly more expensive than the other seats. Second, it gives your potential customers both something to aspire to, and something more expensive to compare the Business and Premium Economy seats to, making it more likely that both of those levels will be purchased more frequently. “Done for you” website set-up. Fully trained Virtual Assistant (VA) provided for up to 40 hours per week. Private, First-Class only three-day retreat at a luxury resort somewhere awesome… all expenses paid. A license to “on-sell” your Premium Economy program as their own. Your personal mobile / cell phone number. The price point for a program like that would be roughly $5k per month. First Class is your “Golden Goose”. It’s your most expensive offering. 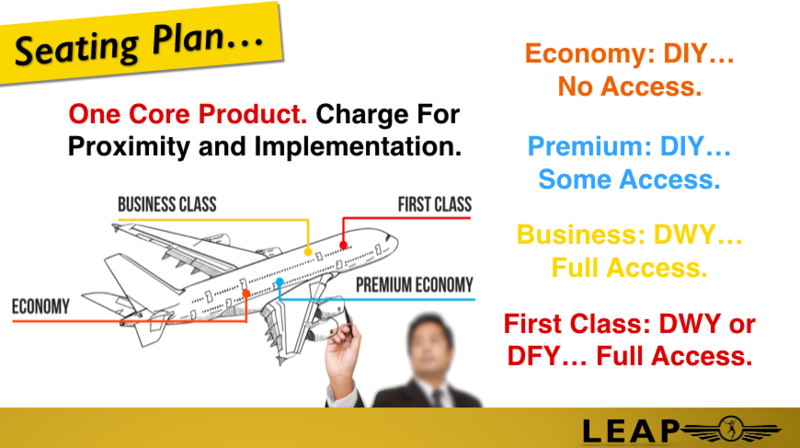 Notice that it’s still not too much more work for you personally than it is to provide the Premium Economy program. The only real differences are an extra three-day event (which, for you, is an all-expenses-paid, tax-deductible holiday with a little work thrown in), and some time to set up a team who can handle hiring and managing the VA’s and building the done-for-you websites. Or… you could pay someone else to build them. That’s how you take one product, and sell access to it at different price points to create a seating plan. And again, because you can expect only 10 to 20% of your clients to upgrade to this level, you can pre-empt that by only offer two places in First Class per year. This stage is where you figure out how much you stand to make per month, and per year, from your Seating Plan. Then you determine how much it’ll cost you to deliver everything… and subtract that from your revenue. That (at a very basic level) is your profit. 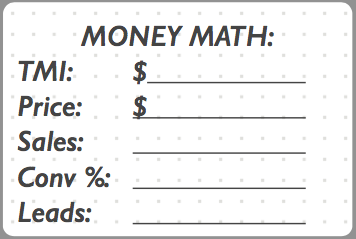 Money Math shows you how much money you’ll make from your Seating Plan per month and year. Zoom webinar system… $14.95 per month. Ontraport CRM… $ 297 per month. Web hosting… $ 20 per month (for a really good one). VA for you… $ 2,000 per month (nowhere near this in reality!). VA x 2 (for each First Class client)… $ 4,000 per month. Done for you website x 2 (First Class)… $ 10,000 each, one-off cost (… more like $2k to $5k in reality). 2 x 3-day live events… $ 50,000 total (including your travel and accomodation). 3-day all-inclusive First Class retreat… $ 100,000 (let’s go nuts… in reality it’ll probably be $20 to $30k). Which means you’re making $104,250 per month, and spending only $20,498.62 per month. So your profit per month is: $83,751.38… or $1,005,016.56 per year. But… how long does it take you to deliver all of this? Monthly group coaching webinar (…assume it’s 2 hours long). 2 hour session per Business & First Class clients (so that’s 12 x 2 = 24 hours per year. Let’s call it 2 hours per month). 2 x 3-day live events per year (… so 6 days). 1 x 3-day First Class retreat (… so another 3 days). You’re looking at 9 days of live, face-to-face training (in exotic locations all over the world), plus 4 hours per month of your personal time. Feed you grapes while you lay on the beach. It’s all good and well to have a killer Seating Plan for your business. In fact, it rocks, big time. If no-one knows who you are or what you do… or why they should choose you over everyone else who tries miserably to do what you do, but isn’t as good as you (see, I’ve got your back)… you’ll still never actually get your plane off the ground. So let’s fix that problem right now. How Many Ways Are There To Market Your Business? Here’s the good news – there are only three. You can have others help you for a split of the profits you’ll make by working together. That’s it… Free, paid, or partner marketing. Ultimately you want a mix of all three, but when you’re first starting out (or starting over), it’s best to cut the fat ruthlessly, and focus your time, attention (and money) on just one. So how do you know which one you should start with? Do you have lots of time and very little money? Start with FREE marketing. It’ll take a lot longer, but it won’t cost much. 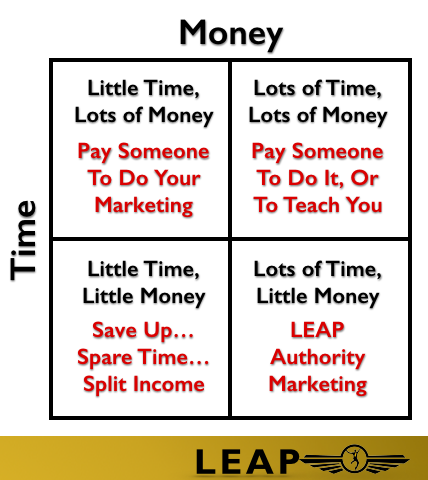 And you’ve got the time here to become great at Authority Marketing (which is something we cover in detail in the LEAP: Lifestyle Entrepreneur Accelerator Program). That also means you’ll be in Ignition mode a lot longer, so your focus here is to get Airborne (make your first sale), and use that money to start paying for some advertising. Do you have lots of money and little time? Pay someone to handle your marketing. Simple, right? Or focus on building partnerships with people who are happy to promote you for a split of the profits. Do you have lots of money and lots of time? You could learn how to do your own marketing, or pay someone else to do it for you. It’s actually a very good idea to find someone who is awesome at, say, Facebook ads… have them manage your account, and simultaneously teach you how it’s done. Just make it explicit up-front that this is what you’re looking for. Do you have little time and little money? 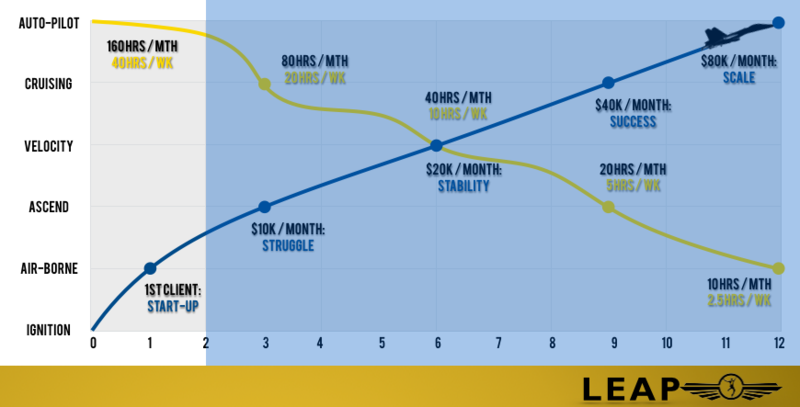 If you’re in this position, it’s probably best if you secure another income stream (like a day job).Maybe you already have one, and that’s why you have little time and little money. Save up money to pay someone to do your marketing for you. Learn in your spare time how to do it for yourself, then work on it when you can (… get up an hour earlier, or go to bed an hour later). Find people who are happy to promote you for a split of the profits. How to choose when to pay for marketing help, or do it yourself. The interesting thing about marketing and advertising is that it’s a variable cost. That means, in basic terms, it’s quite difficult to know exactly how much it’s going to cost you each month, because it’s not “fixed” like, say, your rent or phone bill. Wouldn’t it be great then, if there were a way to “guesstimate” roughly how much you’ll need to spend on your marketing to generate all of that glorious money every month. Luckily for you, there is a way. It’s called reverse engineering. Use Reverse Engineering to figure out how many leads you’ll need. We know you’ve decided to only sell 50 places in your Premium Economy level at $1,000 each per month (giving you $50k per month in revenue from that seating class alone). 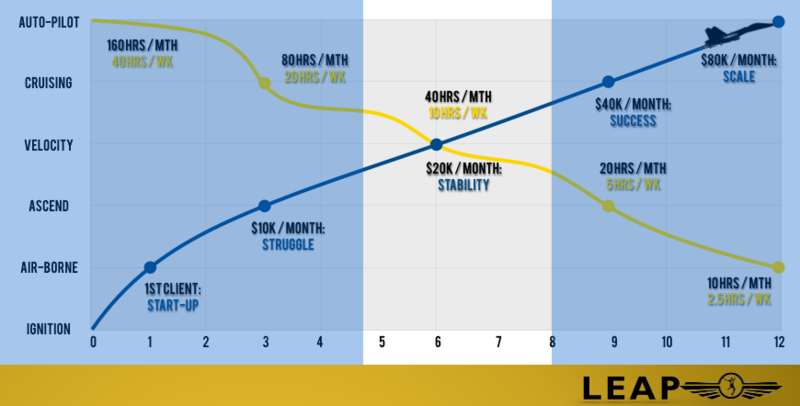 So your Target Monthly Income (or TMI) is $50k. The price point is $1,000, so we know you need 50 sales (per year) to make that $50k per month. Assuming a 20% conversion rate from the Economy level, you’ll need 250 Economy members. And assuming your Economy level program, at $97 per month, has just a 5% conversion rate, you’ll need 5,000 leads over the course of the year. Which is EASY as pie to generate when you’ve taken the LEAP: Lifestyle Entrepreneur Accelerator Program and learned how to “Propel Your Promotion”… so let’s make it a little more difficult for the purposes of this example, and assume you get just a 1% conversion rate on your Economy program. Now you need 25,000 leads over the course of a year. 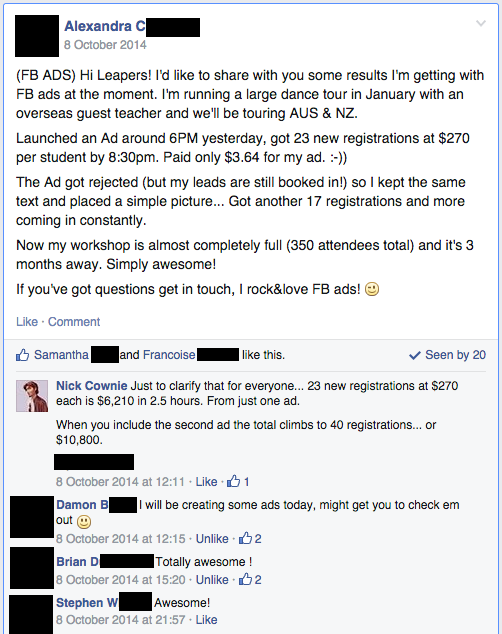 That’s still just 2,084 leads per month… which you can get with just one well-optimised Facebook ad. The power of just one well-optimized Facebook ad. To add one more layer to the process — let’s assume for a moment that in order to generate those 25,000 leads per year, it costs you $25k per MONTH in Facebook ads. That’s an additional $300k per year in expenses. …Which still leaves you with $705,016.56 per year in profit (… or $58,751.38 per month). There are certain tools, systems and resources you won’t be able to operate without. Register your domain name… We use GoDaddy. Get web hosting… check out FlyWheel for rock-solid WordPress hosting. Build your website… I recommend the Optimize Press 2 theme for WordPress. Set up your CRM / auto-responder… The one we use (and the only one I recommend) is Ontraport. Take payments… I’d recommend you start with Stripe. Analytics, heat maps, and conversion funnel tracking… using HotJar. Deliver live-online training and coaching… with Zoom. Manage your projects (and your entire business)… with Favro. Automate your book-keeping… with Xero. Automate your appointment bookings… with Acuity Scheduling. There’s really not that much more to it. If you spend any more time that this on your plan, you’re SERIOUSLY over-thinking it. And to make this process as simple as humanly possible for you, when you go ahead and click the button below, you’ll get instant access to the exact planning template we use in our business to plan out our own Seating Plans. It’s called the One-Page Million Dollar Marketing Plan, and it’ll take you roughly five to ten minutes to complete (if you take your time).